Life of Shane // Thoughts too long for a Facebook status message. God Won’t Give Us More Than We Can Handle? Maybe we haven’t been through anything nearly as bad as their family is going through, but being pushed to our breaking point is something most of us can relate to. And “God won’t give you more than you can handle” is something we hear regularly. Almost isn’t close enough. Satan didn’t spin God’s words very much, but it was enough to throw Eve off completely — and then Satan knew he had her. In the same way, “God won’t give you more than you can handle” sounds right. It sounds Biblical. And we hear it so often, we believe God himself said it. But it’s a bastardization of God’s word that Satan uses to great success over and over and over. God will not allow us to be tempted beyond what we’re able. Tempted. This is the verse Satan wants us thinking of when he tells us that God won’t give us more than we can handle. Just like Eve in the Garden, he tweaks it just enough that it still sounds right but conveys a vastly different meaning that he can then use to his advantage. What does God really say about the level of suffering he’ll allow us to endure? Read the book of Job and see how suffering completely broke him. Read his words of complete and utter anguish. Read Exodus and Numbers and write down how many things God put the Israelites through. Over and over he broke them, leading them through trials that had them begging to go back to being slaves. They knew firsthand that even brutal slavery was better than what they were having to endure. Why does God do this?? At the very least, it can feel mean. At the very worst, it can feel like the actions of an unjust, capricious, power-tripping deity whose feelings towards us are anything but love — a god who gets perverse joy from toying with us. The Bible gives us at least three reasons. It has been my experience that “consider it” is very deliberate wording. There have been very few times when I was able to truly feel joy during suffering. Most of the time we have to just “gird up the loins of our mind” (1 Peter 1:13) and constantly remind ourselves that this is a cause for joy. We don’t feel it, but we can at least keep ourselves from despairing — usually. God is making us better. Our natural inclination is to trust in ourselves — particularly in a country that (rightfully) holds work ethic in such high regard. Satan has never found a good thing he couldn’t turn into a bad thing, though, so the old American self-reliance turns into a complete reliance on self rather than a reliance on God. 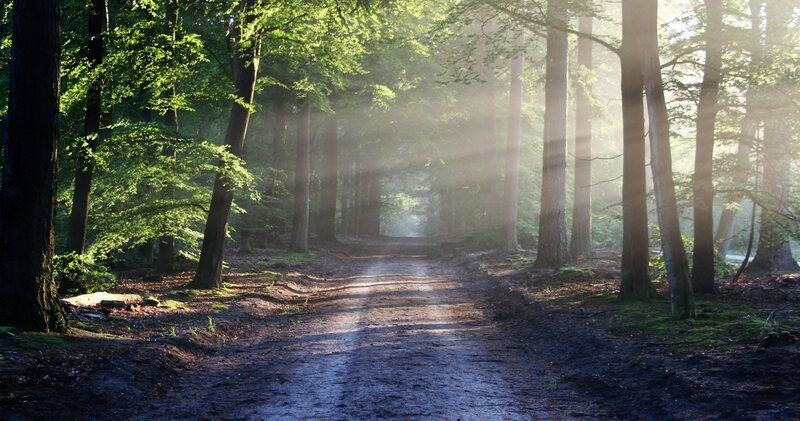 in all your ways know him, and he will make your paths straight. Even with our best efforts, though, we often can’t break the hold on trusting in ourselves. God knows the only solution is to remove everything from our lives that draw our trust away from him — and that’s a brutal process. Dying to self often literally feels like dying. It’s exactly what he did to the Israelites in the desert. …so that we would not trust in ourselves but in God who raises the dead. He has delivered us from such a terrible death, and he will deliver us. We have put our hope in him that he will deliver us again. When God puts us in situations that only he can get us out of — and then he does it — we learn that he will deliver us faithfully and we begin to believe it. Now we have this treasure [of the Gospel] in clay jars [frail, inglorious, human bodies], so that this extraordinary power may be from God and not from us. We are afflicted in every way but not crushed; we are perplexed but not in despair; we are persecuted but not abandoned; we are struck down but not destroyed. We always carry the death of Jesus in our body, so that the life of Jesus may also be displayed in our body. For we who live are always being given over to death for Jesus’s sake, so that Jesus’s life may also be displayed in our mortal flesh. It’s hard to find a good, full version of this poem by Robert Abrahams, so I wanted to preserve it here if for no other reason than to make sure I always have a copy. Let’s not discuss it. I’m not good at cards. Half Philadelphia’s length, if it’s an inch. “Darling Louise,” I whispered, “life comes once. Let’s grab it while we can and make it ours. And what’s the latest fashion from abroad? “We’ll know bright Shanghai of the Bund, Louise. But yet we’ve our frontier in Philadelphia. And that’s the way it always seems to be. You’d find a man unfolding little chairs. Next year’s for living – here is our frontier. The post below is from October 2011. I have published it now because this site’s narrative of our journey is incomplete without it. I have not changed anything except to fix some broken links. I had completely forgotten that this verse was bugging me so much back in February. It hit me again after reading the Kings’ accounts of their experience with Courageous Church, though, because I was reminded once again of just how much what we accept as church these days bears virtually no resemblance to what Jesus said it would look like. Jesus said that anyone who believed in him would do the same works that he did. In the 23 years since deciding that I believed the Bible was true and becoming a total church nerd, though, I haven’t seen that even once. Not once. That describes my life so well right now. What consumes my thoughts are “the worries of this life.” Not without good reason. Our sole source of income is a business I run on my own, and we have a surprise two-year-old who still hasn’t slept through the night for 5 days in a row. Ironically, though, none of that would be an issue if I would consistently keep my priorities in order. Instead, I usually sleep just late enough that I wake up with the day already ahead of me and instantly have to hit the ground running. What suffers is the time I need to draw near to God and have my priorities aligned. Well, I’m done with this substandard life. There is nowhere more miserable than the middle ground, and I am done with it. As vibrant and active and fulfilling as my churches have been, they all largely preached to, as Rai writes, “people who already knew God and were content with just that.” I’ve never once had a church really impress on me that I had to forsake everything in order to truly be a follower of Jesus. Sure they mentioned it, but if you tried to drive that point home too much, you’d end up like Jesus chasing good people away. Following Jesus, by God’s design, must take place in community. We can’t go it alone. We have to be joined with other like-minded people if we want to succeed. If there’s anything we’ve learned over the past two years, it’s that. So we’re expanding on our original mission. We almost had it right, but we still weren’t focused on forsaking all. It was more about simply building community. That’s going to change. You have an open invitation to change with us. If you’re tired of business as usual and genuinely want to change the world, come join us. Be aware, though, that we’re going to hold each other accountable to the same degree that the early church did. We’re very much going to be swimming against the current, so it will take all of us swimming together in order to keep from falling back. Also be aware that (as Shaun so effectively describes), “Change sounds pretty but actually looks ugly, feels like hard labor, takes time, and pushes every limit we have.” It’ll be the hardest thing you ever do, and you’ll lost count of how many times you want to just quit. For the past few years, I have wearily echoed the thoughts of Peter over and over again, “Where else would I go? What else would I do?” The thought that there really was no alternative was the only thing that kept me going. Expect to be persecuted and expect it to come first from those who follow Jesus. Expect to be maligned, attacked and ridiculed from all sides. Expect to grow tired and weary. Expect to want to give up. Expect to lose many old friends. Expect to lose all of your friends where the “church” is the central reason for your friendship. Only your deep and Christ-centered friendships will endure. Expect to be labeled. (a freak, a hippie, a cult leader, a quitter, a fraud, an idealist, a purist, a heretic, a divider, a communist, a jerk, an egomaniac, a devil worshiper) Yes, I’ve been called them all to my face. Expect to weep…deeper and stronger than you ever have. Expect to doubt your calling, your convictions, your path, your faith, and your life. Expect to be seen as utterly unsuccessful. Live. Expect life. Expect meaning. Expect to finally understand the prophets and apostles. Expect to know Jesus and his life…for that is all that you will have…and that is all that you need. I feel like The Ten Minute Bible Hour should have far more subscribers than it does. The Bible is the greatest book ever, and Matt is one of the few people I’ve seen who a) seems genuinely excited about it and b) really knows what he’s talking about. It’s easily my favorite YouTube channel. 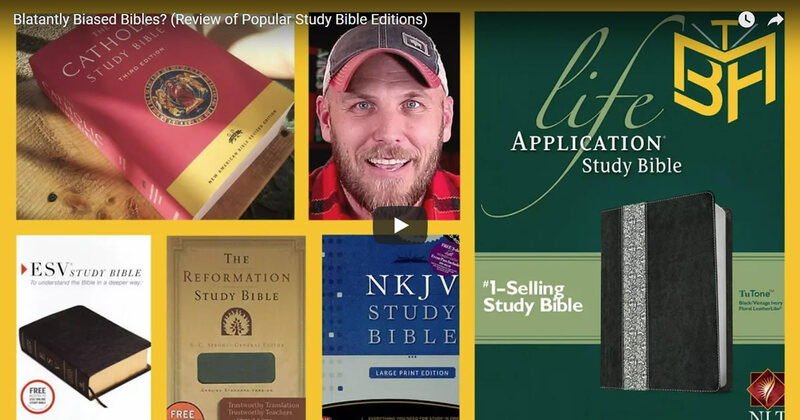 This week he released a video on different Study Bible editions. If you’re thinking about maybe buying a new Bible, it’s definitely worth watching. If you absolutely know what you’re doing, just jump right into the video. If not, see my notes below. Here are my notes. Your mileage may vary, so if they help you, great! If not, totally disregard them. Note: Anytime I refer to a “bible”, I’m referring to a product that someone has published for you to buy. When I refer to the “Bible”, I’m referring to the holy word of God as it was written down and preserved for us outside of any particular translation or format. This video will be confusing if you don’t know the difference between a bible and a study bible. When you’re buying a Bible, you make three choices. This is the most important. The original writings that make up our Bible were written in three different languages. Those languages (obviously) have to be translated into English so that we can read them. There are a number of great translations, and they all have their strengths and weaknesses. Read some passages and pick the translation that is easiest for you to understand. That will vary from person to person. My wife loves the NIV, but, for studying, I was always an NASB guy before recently shifting over to HCSB and now CSB (the newer version of HCSB). Once you’ve picked a translation, you can buy that translation in paperback, hardback, or a wide array of leather and leather-like bindings. The content is 100% exactly the same; it just has a different container. Crossway has a good article on choosing a bible cover material. If you just want the Bible and nothing else, there are plenty of choices. However you will also find a dizzying array of bibles that package your preferred Bible translation with other information. The key thing to remember — and the number one thing that can be confusing about this video — is that these other things are not the Bible. They are things that people added around the Bible to (hopefully) help you understand it better. Bibles can have introductions at the beginning of each book to give you an idea of what you’re reading, cross-references (those tiny things down the middle column), notes (those things at the bottom of the page), dictionaries, indexes, and more. The combinations are almost endless. The notes are the biggest differentiator. There are bible versions designed simply to help you understand the material better, but there are also versions specifically targeted to a particular segment of people or topic: multiple different versions for both men and women, kids, middle school and high school students, college students, life application, recovering addicts, etc. They simply describe and discuss the material in a way more specifically relevant to their audience. The Bible itself doesn’t change — just what they package around it. If you buy an NIV bible, it’s the exact same Bible translation across every different version, regardless of what else is in it. “A Ridiculous Amount of Money”? Well, expensive compared to non-study bibles — but, I quickly realized, not at all expensive compared to other things I buy. Let me show you what I mean. Let’s say you wanted the absolute most top-of-the-line Bible you could buy. This Goatskin Leather ESV Wide Margin Reference Bible looks pretty nice at $310. Maybe that’s too steep for you, though, so you settle for an ESV Cowhide Study Bible for $179.99. Don’t want the premium cover? Get the same version — just with a lesser leather cover — for $79.99. I think $80 is a pretty good price point for this discussion. You can get a really phenomenal study Bible for $80. That’s definitely high when you can get a full Bible for $2, but let me take you through my thoughts as I lay there Tuesday night. If you added up the cost of everything I wear to church on a given Sunday, that’s way more than $80. My car payment used to be $431 — every month. Know how much I pay to have cable TV — every month? And how long will this Bible last you? My wife had her last one for 25 years before it fell apart — and it was her daily driver. It was the only Bible she read out of, and it went with her everywhere. Imagine if you only used it to study out of, though, and bought a cheap Bible to take with you back and forth to church and everywhere else. How long would it last you then? Let’s just use 25 years, though. $80 spread across 25 years is only $3.20 per year — less than 27 cents per month. Once I thought of it that way, I realized $80 wasn’t ridiculous after all. What is a “Theological Persuasion”? If you hold to a particular viewpoint, you might prefer a study bible that shares your viewpoint. That’s what he references both directly and indirectly throughout. You’ll “Outgrow” Certain Study Bibles? Near the end he talks about outgrowing certain study Bibles (the Life Application Study Bible specifically). I agree with that, but it’s not to imply that those versions aren’t as outstanding as others. The Student Bible I had in high school was fantastic, and exactly what I needed. I used a Life Application Study Bible for years after that, and it was exactly what I needed. What you need is what you need. A more advanced study bible isn’t a better study bible. That’s not what he’s saying. Let’s suppose that you could press forward and choose one despite that. What you’ll find is that there is just no way to know what that Bible feels like in your hands — and that’s so critical. Great example: I never would have chosen the large print version of the Zondervan Study Bible, but when I saw it in person the font size was actually perfect and the bible opened up flat, unlike the regular-print version. This is such an expensive — and important — purchase. Nothing can compare to holding the bible and flipping through it in person. If at all possible, find a store with lots of versions so that you can find the perfect one for you. Did you watch the video? I’d love to hear what you think below! We have never experienced God working in the way that he has in our lives this year. It’s been so dramatic that this verse just keeps coming to my mind. The signs and wonders have been overwhelming. I don’t know what he ultimately has planned, but I wanted to document things so far while we could still remember them. Our son is an outstanding student and an outstanding person. He has a perfect academic record since starting school, and his test scores are good enough to qualify him for anywhere he wanted to go. Despite that, Ivy League was never on our radar — heck, nothing outside the Southeast was really on our radar. Especially these days, college is about what you do with it as much as where you go (if not more so). The homeschool program we’ve been a part of for the last five years has taught him to love learning, so we knew he’d excel wherever he ended up. We didn’t feel any pressure to send him anywhere in particular, and he wanted to be close to home as much as we wanted him to be close to home, so we assumed we’d end up somewhere within a few hours drive. Plus, he doesn’t know what he wants to do, so there’s no chance an Ivy or equivalent would even let him in anyway (or so I thought). Then we got the letter. Shortly after PSAT scores were released, we started to average at least a couple of letters from colleges every day. On this particular day, he got letters from Princeton, Yale, and Harvard. That’s pretty fun; I’m not going to lie. The Harvard letter stood out — literally and figuratively. For one, it’s Harvard. But more than that, they sent it in a full-size envelope so that the letter wasn’t folded. We had all these regular-size business-sized envelopes… and Harvard. Have you considered Harvard? Your strong grades and standardized test scores indicate that Harvard and other selective universities may be a good fit for you. Later in the letter, they note that it costs less than a state school for 90% of American families. Now you’ve really got me! So I did; I took a few hours to really consider Harvard. It’s definitely impressive. I ultimately decided it wasn’t a good fit, though, because they didn’t offer a finance major or anything closely related except for economics. (Finance is what he’s strongly leaning to, and the only thing we’ve found so far that strongly piques his interest.) Oh, well. Maybe for grad school. Well not only did he do his undergrad at Harvard, he majored in History, which Harrison has always loved — and which we’ve always discouraged him majoring in (because what kind of job can you get with a History degree, right?). Hmmm… Maybe I should take another look. So, completely contrary to what I originally believed about colleges like Harvard, they actually believe that students should decide what they want to do once they get to college. It was clear that Harvard was an option we should explore in-depth, so I reached out to a good friend to see if he had any good Harvard contacts that could help us learn more. As you can imagine, the pressure of being solely responsible for your child’s education can be extreme — and it’s particularly stressful with the oldest. If you screw up, there’s always time to fix things for the younger ones maybe, but the oldest one only gets one chance. The closer Harrison got to high school, the more Jennie felt this. She is an elementary school teacher. She worried constantly that she wouldn’t be able to help Harrison live up to his potential now that he was getting further and further beyond what she had been educated to do. How could she possibly do for him what teachers in a “real” school could do? We had no doubt that God wanted us to keep homeschooling, though, and as Harrison started high school, God told Jennie that what he wanted her to focus on was this: Is he with me? — that education was crucial, but far and away her most important responsibility was leading Harrison to continually grow closer to the Lord. Is he with me? There’s a pretty common perception that the farther you travel from the Southeast, the more Godless it gets. While there’s some truth to that (based on things like church attendance), it’s too easy a jump to get from there to thinking of the Northeast as completely Godless. That’s obviously not true, but we did want to explore how Harvard would impact Harrison spiritually. Thankfully, my friend connected us with a local Harvard grad who not only has been very successful, but is also an ardent advocate for Harvard and as strong a Christian guy as I’ve ever met. He took time out of his completely packed schedule to have lunch with us and answer all the questions we had. We left the lunch feeling even more strongly that Harvard could be a good fit for him, so it was time to visit in person. God had shown us enough to get us on a plane to Boston, but we had no clue how much he still had planned. I had been praying that God would help me to know with certainty where Harrison should go to school. I prayed mostly that God would put him where he could grow closer to God and where he could be used by God. I also prayed that he would help Harrison to know and be excited about where he was going. I longed to see him get excited and show some emotion about the school he would attend. I mostly prayed that God would give me a peace about everything. It was truly such a weight on my shoulders that I desperately wanted to remove, but simply couldn’t figure out how. I wanted so badly to give it to God and release the worry. As we boarded the plane, I was flooded with emotion. I could not believe that we were going to visit Harvard with our son. Harvard? Really? How did I raise/teach a child who had a legitimate chance at getting into Harvard? He certainly did not get the intelligence gene from me. My heart was full of gratitude for having this chance and for having the means to take our family on a vacation like this. We have been so incredibly blessed and it really hit me in that airplane seat. I thanked God and prayed that he would continue to use our family to bring him glory. I continued to pray that God would show us where Harrison could best do that. I still held onto my thought that Harvard might not be the best place for a Christian young man to grow in his faith. But God, in his infinite wisdom and abundant grace, began to show me, in his perfect timing, that he indeed had Harrison in the palm of his hand and that no matter where Harrison landed, he would take care of him. Little by little, God began to tug away the fear I was so tightly hanging onto. God speaks to people in different ways. For me, God almost always gives me little or not so little signs when I pray for them. I believe it is because knows he my insecurities and realizes I need the affirmation of a sign. Well, God gave me one sign after another on this trip that he was indeed in control and that he was a loving God that cared for my son. The first of those signs came on the plane when the polite stewardess placed our beverage napkins onto our tray tables. 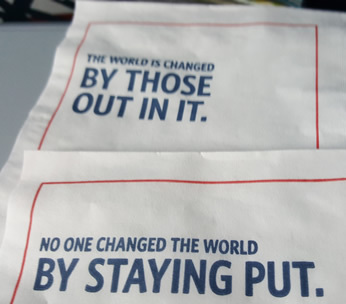 My napkin said, “The world is changed by those out in it.” Jonathan’s napkin said, “No one changed the world by staying put.” Ok, Lord, I hear you, but my mama heart is not convinced. I am going to need a little more. Knowing what was to come, he had to have laughed at her asking for a little more. As we were walking around Boston the first day I asked Harrison what he thought of it. He said he liked the city, but that he felt it was a one and done type of place. He would enjoy seeing it, but probably wouldn’t come back any time soon. In my human reasoning, I thought, okay, so Harvard and MIT are going to be off the list. However, God in his faithfulness gave me more. … I prayed before heading out to Cambridge Thursday morning, “God, help me to know if he will be ok here. Help me to know if this is the place for him. Help him to know for himself if he should go here.” I was a bundle of nerves as we drove there. I prayed for peace. He answered. When we stepped out of the car, I was thinking this is pretty, but not quite what I expected. Then we opened the door of Sanders Theater. I think I literally gasped. It is so amazingly beautiful. The stained glass, the woodwork, the Latin all took my breath away. I heard Harrison say,” Wow!” He didn’t balk at all about having his picture made and the smile on his face in those pictures is a true smile. The students at the check-in table were so nice and genuinely friendly. They were not the serious, solemn, arrogant students I had pictured in my mind. They directed us to the theater and we sat down in the pew and looked up and saw “Welcome to Harvard” on the big screen. I almost cried at that moment. What followed next was a video, put to the song “Anything Could Happen.” The video featured students from Harvard and their personal stories. The first person featured was wearing a Harvard Basketball t-shirt. (Basketball is Harrison’s sport.) He was from Tucker, Georgia. Ok, Lord, you have my attention. It helped that they showed him playing basketball with friends, playing video games with friends and wearing a ghostbusters t-shirt in addition to showing his classes and research. The next story featured was also a basketball player. I liked that he said, “Harvard let him explore everything.” Since Harrison is really not certain of what he wants to do, this made me feel so much better. After the video, we heard from two different students as well as an admissions officer. They were fantastic. Harrison was engaged and smiling and interested the entire time. I loved everything the admissions officer had to say. He painted a lovely picture of Harvard, but without any trace of arrogance or elitism. We then toured the campus. Our tour guide was very personable. The campus was beautiful. Harrison looked at me during the tour and with a big smile said, “I really like it here!” I had prayed for emotion and now I had it. After our tour we visited the Harvard book store. At other campuses, I had asked if he wanted a shirt and he replied that it seemed weird to get a shirt if he wasn’t sure if he was going there. However, he was thrilled to get a shirt from Harvard. I was amazed at how much he liked this school. Harrison is not a very emotional guy. He’s a deep thinker, but that doesn’t present as emotion very often — and definitely had not shown up in our prior visits to Samford and UGA, despite the fact that he liked them both. When Jennie told me later what he had said, I knew it was a big deal. 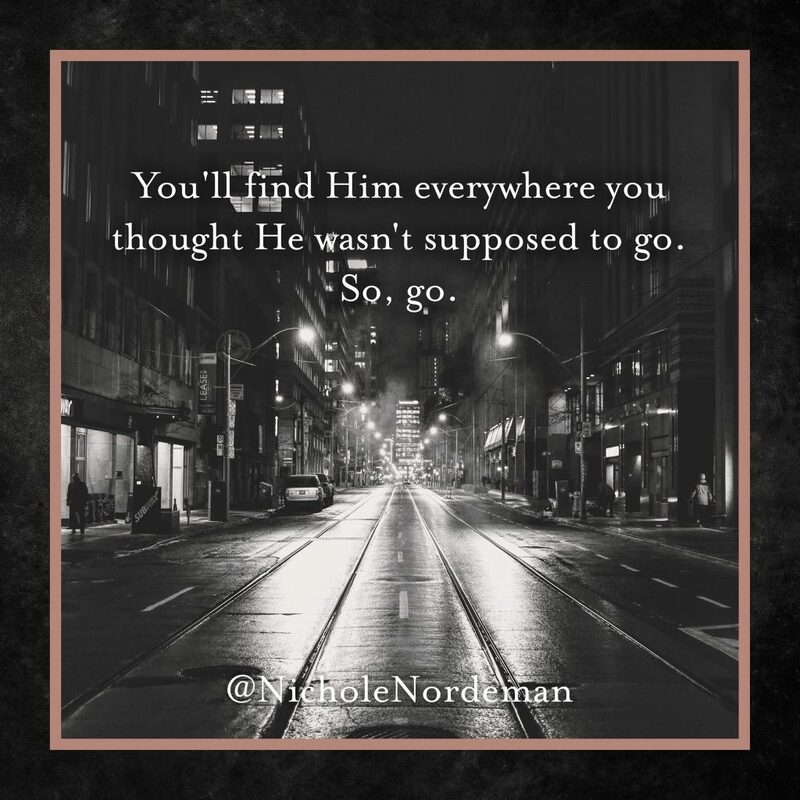 Saturday night as we were getting ready for bed, Jennie was browsing through Instagram and exclaimed, “OK, that Nichole Nordeman has made me mad.” Oh, no. Nichole is one of her favorites. What happened?? It was powerful all on its own, but looking back we can see now that God was setting up for the grand finale. We got into Boston Wednesday afternoon and saw a ton of sights before bed that night. And Thursday and Friday we saw so many more that I began to wonder whether we had planned too long a trip. What were we going to do with two more whole days Saturday and Sunday? More than once I pondered changing our flight home from Sunday night to Saturday. (Hotels in Boston are not cheap; leaving a day early would make a huge difference.) God wouldn’t let me, though, and Friday night I found out why. I woke up at one point that night and God said, “You should go to church on Sunday.” Well, duh. If one of the main reasons we came is to see what life would be like for him here, shouldn’t we see what church would be like? So the next morning I started looking for churches near Harvard and God led me to Park Street Church. I spent a long time researching them and felt confident that’s where he wanted us to go. We showed up at 10:30, well before service started or before anyone much was even in the sanctuary. It probably seats 600 to 800, and we had our pick of seats — plus time to settle down and take everything in. The first thing I thought to check was the hymnals. What kind of songs do they sing? Do I know any of them? The previous week in Sunday School, we had talked about one of my favorite hymns. I had noticed that it wasn’t in our own church’s hymnals, so I figured that might be a fun one to look for. As I picked up the hymnal and flipped to the index, Mary Elizabeth whispered loudly to me from farther down the pew, “Mom says we’re singing one of your favorite hymns.” Sure enough, I looked in the order of service and there it was in black and white: “Come Thou Fount.” Not only was it in the hymnal, God had picked it out for our visit. The service started with a large Methodist youth choir from Brentwood, TN, singing an amazing Latin piece. I was just blown away. I love choral music, and especially when it’s sung in a large, soaring church. (I even have a Pandora station just for choral music.) To be sitting three rows away from them, just swept up in the middle of the singing, was one of the most personal, loving expressions of love God has ever given me. He didn’t have to do that, I didn’t need him to do it, but those are the truly amazing gifts — when he does just because he can. It was overwhelming. The second song they performed really caught my attention. It was not the song they had planned to do. It was not the one listed in the bulletin, but it was the one God wanted me to hear. The words said, “Can the hand of God, can the voice of love find me even here?” At this point, I was just trying to hold back tears. Mark and Bev deserve their own section. There weren’t 10 other people in the sanctuary when we got there, yet God had Mark and Bev come sit right behind us shortly after we sat down. Right behind us — in a church where they could have sat a million other places. We soon found out why. I felt a gentle tap on my shoulder and was sweetly welcomed by a lady named Bev. She and her husband Mark asked if we were visiting Boston and then asked if we were visiting colleges. She looked at me and said, “It is both exciting and terrifying all at the same time.” My thoughts exactly. She shared how her three boys had gone off to college. She said they all left home and only one came back. Sensing my anxiety, she placed her hands on mine and said, “Only one came back home, but I see them all often. They visit a lot.” This woman understood. Her husband then looked at me and said that he would pray for my son and for us as we were making these decisions. He laughed and said he would do his best to remember. His wife then leaned in and whispered, “He never forgets. If he said he will pray for your son, he will.” I wanted to cry. These people we just met were already willing to pray for my son. They talked for a few minutes before the service, then several more minutes afterward. I couldn’t hear them, but I could tell Jennie was enjoying it. Before we left, Jennie stopped by the ladies’ room. When she came back to meet us, she had this look on her face like something unsettling (in a good way) had just happened. I asked her about it, and she said it was nothing. I could tell it was because it was taking everything she had to hold it together. He could not have given her a more intimate, loving sign. The realization I had that day that Jesus truly and fully does know what we feel as parents was overwhelming. 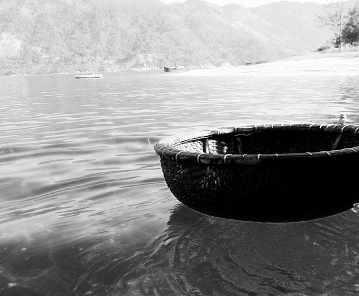 There comes a time — many times, actually — in the lives of our children where we have to put the basket in the water. We have to let go and trust the plan of the Father. The world is a scary place — a place where we fear our children could drown. But we must remember that we have to let go so that God can draw them from the waters for His great purpose. He has called us to be their parents, but they were His first. We have been home several days now and as reflect on our trip, I am just so thankful for the way that God answers prayer. He has not only given me peace and helped me to release my fears, but he has shown me how much he loves and cares for us. While I still am not convinced that Harrison will end up at Harvard (after all their acceptance rate is only 5.2%) I am certain that no matter where Harrison ends up, he will be taken care of. God has a perfect plan for his life. He is in control, not me, and he loves Harrison with a perfect love that I cannot even begin to comprehend. God showed me in visiting Harvard that he will take care of Harrison and that I don’t need to be afraid. God can find him even there. Last summer, I spent 16 days in Central America and subsequently accepted a position as HOI‘s board chair for economic development. Since that time, I have been working to come up to speed in an arena where I had zero prior experience. Thankfully, with HOI there are amazing people with 25 years of in-depth experience who would love nothing more than to share it. Last month I returned once again, this time to spend nine days focused specifically on economic development. In each village, Eriberto Rivera, our Economic Development Coordinator, presented them with the plan they had worked on previously, went through the report page by page to remind them of their goals, and then let them discuss what progress had been made so far. We saw an amazing gamut of plans: egg-laying operations, pork producing, ceramic tiles, and small stores just to name a few. Some villages were very far along — a couple of them to the point where there was nothing they needed from us at this time. Other villages were making slow progress, but still seemed to be moving forward. Only one village wasn’t making any progress at all, and they quickly admitted that they probably wouldn’t. They were a great example in contrast between how organizations like HOI work and how we’re tempted to work as North Americans coming into situations like this. Read Toxic Charity for complete details, but the essence is that too often our good intentions, rather than helping those who need help, diminish their dignity and increase their dependency. That’s what we saw in this village. It was easily the most affluent that we visited, apparently because they receive a steady flow of donations from another organization. As a result, the people weren’t motivated to work or further improve their situation. I would be the same way. It quickly became clear — and was confirmed throughout the week — that Eriberto is amazing. He handled not only the easy, positive meetings, but also the ones that didn’t go so well. He was able to adjust seamlessly on the fly with seemingly no effort at all. Meeting after meeting, I was just blown away. What an amazing asset God has blessed us with in him. The micro-enterprise portion of our efforts is in tremendous hands. Through Blood:Water, I get to be in the broken places where suffering and joy meet. Because of this work, my faith tends to be an active, broken, and constantly winding journey of simply trying to follow Jesus’ example of love. Man, that hit me right where I was. These trips have been a continual cycle of pain and realization as things I have believed most of my life get tested in the real world. This trip was no exception. That bothered me, but what bothered me most was that I couldn’t figure out why it bothered me. I mean, what was wrong with that, right? I took me several days to finally figure it out. My first realization was that it called into question what I had been doing up until then. At no point during our village meetings or in our discussions afterward did this concept ever come up. Oh, man. Should it have? That led me to analyze why I was here in the first place — something I had never stopped to consider. Is creating followers of Jesus our sole purpose? Is that the agenda? Is everything else just a means to an end? All authority in heaven and on earth has been given to me. Go therefore and make disciples of all nations, baptizing them in the name of the Father and of the Son and of the Holy Spirit. I grew up in a tradition where these were our highest goals — so much so that they had become our only goals. Only in the last few years have I started realizing just how much Jesus’s methods differed from ours. As I read through the Gospels independently, one of the things that struck me was how often Jesus ministered with no apparent agenda. Healing after healing was performed with no “presentation of the Gospel” or even the handing out of a tract. (I’m not going to lie, my first reaction was “Man, he missed a lot of great opportunities.”) He ministered to hundreds, maybe even tens of thousands, knowing that virtually none of them would ever follow him. Why would he do that? What a seeming waste of time for someone who had less than four years to accomplish his goals. You shall love the Lord your God with all your heart and with all your soul and with all your mind. This is the great and first commandment. And a second is like it: You shall love your neighbor as yourself. On these two commandments depend all the Law and the Prophets. It was the same answer he gave when someone else asked, “What shall I do to inherit eternal life?” In that instance, the man probed further and asked, “Who is my neighbor?” Jesus responded by telling the parable of the Good Samaritan. 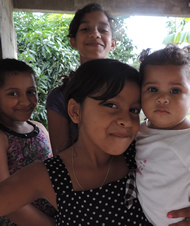 God has made the people of Honduras and Nicaragua my neighbors. My responsibility is to love them just as I love myself. In this particular situation, at this particular time, that means working with them and for them to develop economic opportunities. There are amazing organizations like Cafe 1040 working in contexts where people have never heard of Jesus. It’s different there. The people I’ve worked with so far, though, don’t need to hear about Jesus any more than my friends in America need to hear about Jesus. They’ve heard plenty of words about Jesus that don’t come accompanied by action. What they need is to see Jesus lived out — to see love like Jesus loved. When that happens, everything changes. That, I realize now, is why I’m there — and here. Between May 18 and August 12 this summer, I spent 16 days in Honduras and Nicaragua. 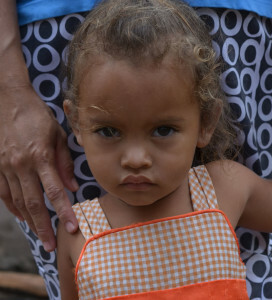 I was traveling with HOI, an organization that has been working in Honduras’s Agalta Valley for 25 years now. This is an exhaustive (though brief) run-down of everything I personally did. For more info on HOI, two great resources are their answers to commonly asked questions and their write-up on the extraordinary results of their work. We had been giving money to HOI for over a year and very strongly wanted to get down to Honduras to actually see the work for ourselves. Our opportunity finally came in May. Along with a handful of others, Jennie and I left Sunday evening for Tegucigalpa, Honduras. We landed and immediately hit the road to Juticalpa (with a brief rest stop at the Mennonite bakery). 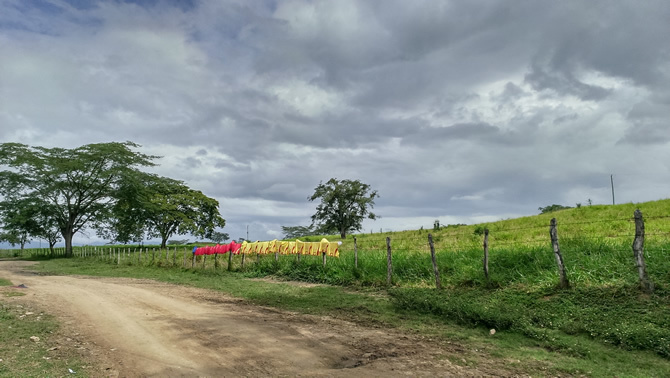 We spent the night at the Hotel Boquerón in Juticalpa, and then hit the road for Rancho Paraíso (HOI’s home base in the Agalta Valley) first thing the next morning. The setting of the ranch is just stunning. It’s impossible to convey in photos just how beautiful this area is. It’s easy to see why so many people love it. To the right is just one of the scores of photos we took. HOI’s mission is to not only feed the poor, but to empower them to escape long-term poverty for good. A key component of that is community development. When you’re dealing with the second and third poorest countries in the Western Hemisphere (behind only Haiti), there is an incredible amount of simple groundwork that must be laid. In each village, HOI works to establish five basic things for each home: a dedicated place to use the bathroom, chimneys to expel cooking smoke, concrete floors instead of dirt, potable water, and electricity. After lunch at the ranch on the 19th, we spent the afternoon visiting some of the nearby villages to see that work in person. Another key component of breaking the cycle of poverty is education. The morning of the 20th, we spent a couple of hours at the school. Each elementary school class sang us a song (including “Head, Shoulders, Knees & Toes” in English), and we got an in-depth tour of all that was going on. Needless to say, as a teacher this was probably Jennie’s favorite stop. A third key component is health. Obviously much of the community development work is to support this effort, but there are a couple of other ways that HOI is addressing it as well. We got to experience a couple of them up close the afternoon of the 20th. The first is with medical clinics. HOI has built and staffed several different medical clinics around the area where local residents can have a number of health issues addressed — both proactively and reactively. They have also initiated a dental program this year, complete with a mobile dental facility. The second is with nutritional education. The beautiful girl to the right is just one of the many children we met on the 20th. (Click the image for a better view.) We marveled over the gorgeous blonde streaks in her hair until we learned that they were evidence of severe malnutrition. Her mother is one of the villagers who, with the encouragement and guidance of HOI, now has her own garden in order to grow the vegetables that will provide the nutrients that she and her little girl need. 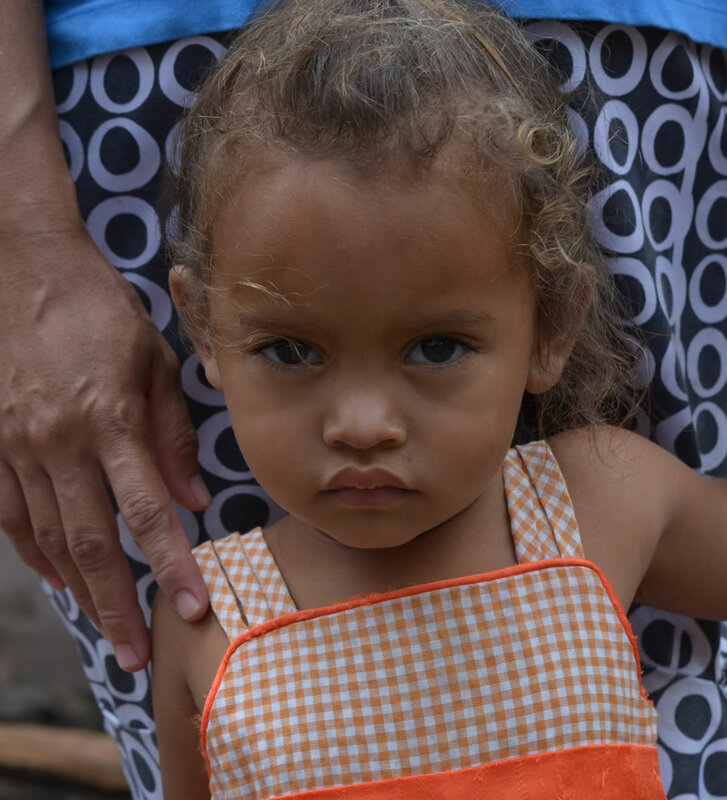 Convincing the people that they need more than rice and beans is just one of the many steps in breaking the cycle of poverty. While Jennie and I were so thankful to have gotten to go to Honduras, we still longed to be able to have the kids experience it as well. That opportunity came in July as HOI led a trip to Nicaragua — a new location where they have recently begun work. 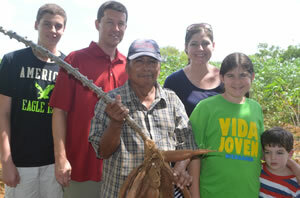 It was valuable to see the beginning of the work, compared with the mature work in Honduras. We had an absolute blast. I cannot recommend a family trip highly enough. Even Jonathan, who’s not yet five, had the time of his life. 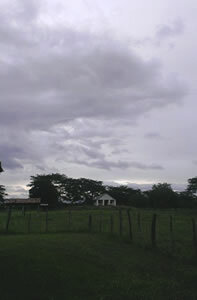 We arrived in Managua late on Sunday night, so there was virtually nothing to see until we woke up on the 14th. Thankfully, Managua delivered right away. The kids got to eat breakfast in the open-air dining room as the cat wandered around. From there, we headed up to Finca El Petén, our home for the next three days. Residing high in the mountains of Jinotega, the beauty of this place cannot be overstated. Highs were in the upper 70s and low 80s during the day, with lows at night in the 60s. And there was always a breeze. Just as with Rancho Paraíso, it’s a stunning location. After getting settled in, we visited Los Robles (the village where we would be working the next day) and the farm operations of Finca Java. July 14th was our big day. While most of the group spent the morning mixing and pouring concrete floors for two of the houses in the village, Jennie and Jonathan colored and made sticker pictures with some of the children. They colored and played for hours. Once the floors were done, we headed back to the finca for lunch and a little rest. Then it was time to head back into the village. We dropped some of the group off at the local soccer field to play with the locals. The rest of us went back to the village gathering area to do a short Vacation Bible School with all the village children. After the Bible stories and crafts came the best part (at least for me). Mary Elizabeth had made a Rainbow Loom bracelet for every child in the village — 22 in all. They were thrilled. Here’s a video of her handing them out. The next day, we left the finca and headed back south to Granada. On the way, we stopped at the Young Life camp in Matagalpa. Young Life has done some amazing work in Nicaragua, and it was exciting to hear about it and witness some of it in action. Opportunity International is another organization that we have supported for some time (Opportunity Nicaragua specifically) and couldn’t wait to see in person. After a fantastic dinner at El Zaguan on the 16th with Opportunity Nicaragua Executive Director (and Alabama grad), David Kone, we enjoyed a great night’s sleep and then hit the ground running on the 17th. Our first stop was a visit with yucca farmer Don Concepcion. Opportunity’s work in Nicaragua started with the yucca farmers and has just exploded. From there, we headed to the yucca processing plant. Opportunity buys the yucca from the farmers and harvests it for them, providing them much greater revenue than they ever had before. They then turn it into a wide array of products, using every single part of the plant. After the yucca operations, we headed to their amazing school. There they teach the kids not only advanced agriculture or tourism skills, they also teach them how to do it specifically as entrepreneurs. 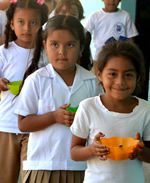 The school includes a vast organic farming operation with a variety of fruits and vegetables, as well as a large egg operation. Finally, it was up to the edge of a vast crater lake where Opportunity is building a new ecolodge that will not only provide additional revenue for their Nicaraguan operations, but will also provide a place for on-the-job training for students of the school. Seeing their work in person was every bit as exciting — and challenging — as we thought it would be. By the Nicaragua trip, it was becoming apparent that God had in mind a much bigger role with HOI than we had anticipated. So I accepted an invitation back to Honduras for an opportunity to see things at a much bigger-picture level. Our first stop, the afternoon of August 6, was a meeting in Tegucigalpa with Fundación para el Desarrollo Municipal (FUNDEMUN) to hear their plans for building several biomass power plants in Honduras. The country has an abundance of biomass fuel (and places to grow more), a severe power generation problem, and dramatic underemployment — making these plants a perfect addition to the economy. The next morning, we had breakfast at the Casa Presidential with the Honduran president’s chief of staff, Jorge Ramon Hernández-Alcerro, a member of HOI’s board of directors. We covered a wide range of topics, including how the U.S. is helping the Honduran government in their fight against drug trafficking in the country and the latest with HOI’s work in the country. After breakfast, we hit the road to San Lorenzo. After settling into our home for the night, we headed to the offices of the Agrolibano Foundation, one of the companies who lobbied (successfully) for HOI to add southern Honduras as a new project location. There we learned about the community development that Agrolibano has already been doing, including the complete turnaround of the local hospital. The next morning, we toured one of the villages bordering the vastmelon farms of Agrolibano, met with the ladies of the village, and visited their school. Next it was back through Tegucigalpa and on to Juticalpa for the night. Bright and early the next morning, we were off to the school and vast farming operations of El Sembrador. El Sembrador takes the best and brightest students from all over Honduras and gives them not only an excellent academic education, but spiritual education as well. The farms help fund the school with extensive dairy and beef cattle operations — all of which were a great learning opportunity for us. Have I mentioned that everywhere down there is just gorgeous? After our visit to El Sembrador, we hit the road to Rancho Paraíso for a couple of nights. We took in a soccer game at the ranch and met with a few of the Young Life leaders in Honduras to hear how their work was going. We were met at the ranch Saturday night by more than 200 kids streaming out of a Young Life meeting. Not bad for just a few months’ work by the Young Life couple newly arrived on the ranch. Sunday night, we got confirmation that the president of Honduras would like to meet with us Monday afternoon, so we headed out from the ranch first thing Monday morning. Over coffee in his Oval Office, we discussed several topics and just generally spent time learning about one another’s efforts at improving life in Honduras — a task that takes many hands. I have no idea what the future holds, but I certainly hope it includes more trips to Honduras and Nicaragua. A single visit is truly life-changing; three in one summer was amazing. I know I can’t possibly answer even most questions in a short post like this, so feel free to fire away if there’s something you’re interested in. And if you’d like to get a better sense of what it’s like there, we have lots of great photos (thanks to my awesome wife) and many videos as well. We’d love to sit down with you some time and give you a more in-depth look. Better yet? Go with me next time. I’m not kidding. We’ll put together a special trip designed just for you and what you’d like to see and do. With three different locations, there are a ton of options. Heck, just look at all the different things we did. Mary Elizabeth asked me before we went if I thought she’d like it better than Disney World. I told her I thought she would. No one does it like Disney, but the depth of experience on a trip like this is one that Disney just can’t touch. What would happen if you suddenly raised the bar? One of Neil Cole’s mantras is “We want to lower the bar of how church is done and raise the bar of what it means to be a disciple.” I’ve written about it before, but raising the bar of what it means to be a disciple is just one of those topics that seems bottomless when you’ve spent 23 years with a very low bar. A question that I have been pondering lately is one for you professional clergy out there. Jesus had a very high bar for his followers; his call was absolute: Leave everything and follow me. He even went out of his way to chase off followers who had been following him but who weren’t 100% committed. He didn’t tolerate a middle ground. From now on, we will live by these words of Jesus. If you want to follow him to any lesser degree than he requires, we will not be the church for you. There are plenty of other churches who will be glad to take your money and include you on their rolls with no other demands of you, but we will no longer be one of those churches. From now on, we will follow Jesus absolutely, and we will help you to do the same if that is your desire. If you are here and have never made the decision to be a follower of Jesus, we invite you to do so with the same conditions that he gave 2,000 years ago. Or, just hang around to see what this crazy experiment of actually living like Jesus produces. Either way, we don’t want you to have any illusions as to what following Jesus really means. He told those who were thinking of following him to first count the cost of doing so. Obviously I’m sure you would phrase it differently, but the point is this: What if you drew a line in the sand once and for all? As Jesus did 2,000 years, tell people that they’re either in or out; there is no middle ground. I’m sure it would get crazy in a hurry. Would you even keep 10% of those who regularly attended? Could you continue to pay the upkeep on the building and facilities (or even come close)? What would the fallout be? More importantly, though, what would prevent you from doing it? Why don’t we do this every Sunday? I’ve been in church for 23 years now, but I can’t ever remember someone making sure I understood that it was all or nothing. If they had, how different would my life be now? How different would our churches be now? How different would the Church be? I don’t know the answer to any of these questions. I am honestly posing this question to you guys as someone who is genuinely inquisitive. I am speaking from a position of significant ignorance. It’s just a question that has been stuck in my head for over a year now, and I can’t shake it.